Global Kungfu News Advocating leadership and branding leads the future. On November 4th, 2018, the “One Belt, One Road” China Brand Internationalization Forum was held in Beijing Diplomatic Building. The theme was “Thinking, Strategy, Brand” and “Innovation, Inheritance and Persistence”. 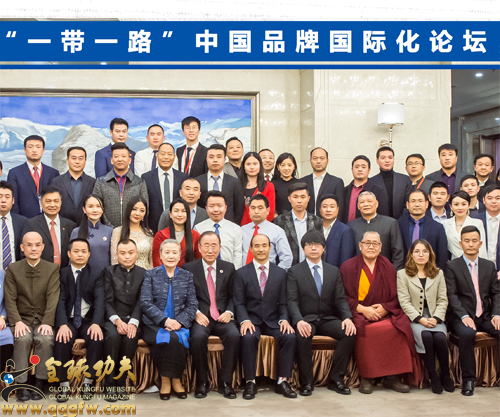 The United Nations Friendship Envoy, Chairman of the China Private Economics International Cooperation Chamber of Commerce, the Vice-Chairman of the 9th and 10th China Wushu Association, and the President of International Kung Fu Federation(IKFF), Mr. Fu Biao, attended the conference. With the former UN Secretary-General and the new chairman of the Boao Forum for Asia, Ban Ki-moon, once again shake hands and talk about the prosperity of martial arts culture and promote international peace and development. Ban Ki-moon's appearance is gentle and sincere with excellent eloquence and extraordinary memory. 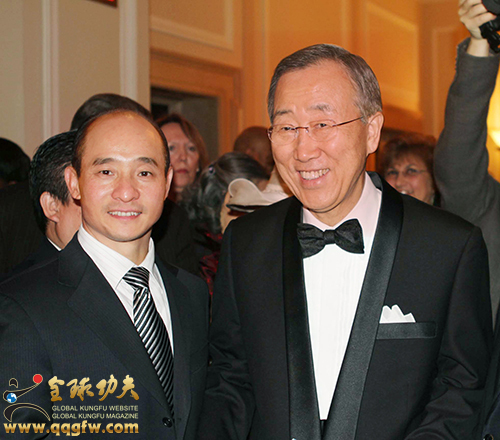 On October 21th, 2010, when the United Nations Headquarters Building in New York commemorated the 65th anniversary of the founding of the United Nations, Fu Biao and Secretary-General Ban Ki-moon shook hands for the first time to introduce the development of Chinese martial arts. The martial arts originated in China and belongs to the world. Higher than sports; Chinese martial arts has a long history, profound and profound, with a profound cultural connotation and unparalleled charm, occupying an important position in the global cultural market. The NO.27"Global Kung Fu" magazine journal reported this important event. On November 4, 2018, after 8 years, Fu Biao and Ban Ki-moon shook hands again! Fu Biao said, "The sincerity is here, the stone is open." We must promote the Belt and Road Initiative with a broad mind, a spirit of hard work, an inclusive principle, and an attitude of reference. We take culture as the context, set up martial arts, and sing in the economy. Sharing wisdom, communicating with the people, and promoting cultural and communication facilities, smooth trade, and financial communication, and changing the "people's hearts and minds" into "people's hearts and minds" to create a community of human destiny. 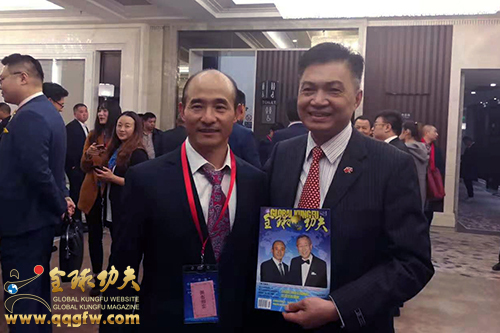 Ban Ki-moon watched the beautiful cover of "Global Kung Fu" magazine,on which with the friendship photo between Mr.Fu Biao and himself,some feelings aroused from heart. Emphasizing the promotion of martial arts culture around the world, and also hoping that Chinese martial artists and entrepreneurs will contribute more to international affairs. Don't forget to contribute to the global poverty-stricken children's efforts to get rid of poverty.Don't forget November 4th Japan is the second anniversary of the entry into force of the Paris Agreement, acting to reduce greenhouse gas emissions targets and enhance its ability to cope with climate change.